London South Bank University (LSBU) has commissioned a new virtual engineering laboratory, carefully designed to help students become more industry-aware and give them familiarity with new technologies to design, develop and test their ideas. 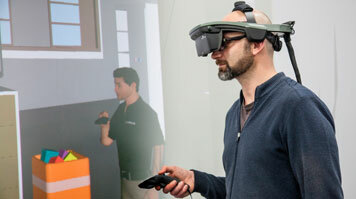 The laboratory comprises five zones - the virtual reality auditorium, the project-based learning laboratory, the rapid prototyping and post-production suite, the digital factory and the head-mounted-display suite, which allows students to navigate their engineering projects in 3D using virtual reality headsets. Combined these zones allow students in LSBU’s School of Engineering to perform detailed design reviews, rehearse in-depth training tasks, validate maintenance procedures or verify assembly and manufacturing processes at 1:1 scale. The technology used enables students to view their engineering projects in real-time, using the latest 3D modelling and visualisation technologies. Viewing a project in virtual reality has many benefits to the engineer. Aside from gaining a greater understanding of how the project will work when fully realised, the engineer can also spot any flaws or potential risks in the project, and correct these prior to further development. The new facility offers an immersive interactive experience that provides users with the opportunity to experience a wide range of industrial environments first hand. It give students the chance to develop practical skills that would under normal circumstances be prohibitive due to economies of scale. Find out more about studying Engineering at LSBU.